We meet during term-time to chill out together and have fun whilst finding out more about the person of Jesus! Friday evenings are aimed to be very accessible to everyone whether they would call themselves a Christian or not. It is a great way to find out what the Bible says about God, Jesus and us, whilst also having great fun & making new friends. Sundays are aimed at those who want to go deeper into what it means to be a Christian. 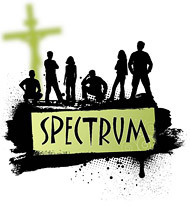 This Summer Spectrum will be having three Sunday evening sessions. These will include take away pizza and engaging teaching in a variety of formats on Living Church. On Wednesdays we hold an additional Bible Study for those of 6th Form age where we have dinner and dig deeper into what the Bible says and what that means for us. Please contact the Church Office for details.